North Branch Arts and the Edgebrook Chamber of Commerce today announced the winners of the 2016 “Uniquely Edgebrook” photography contest. The contest gave photographers the chance to showcase their skills by submitting photographs that captured the charm and uniqueness of the Edgebrook community. 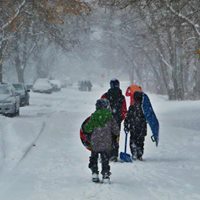 Photo features children walking down the middle of Leader Avenue to go sledding down the hills of the Billy Caldwell Golf Course. Photo was taken outside of the Chocolate Shoppe located on Devon. Photo featured the Edgebrook Television storefront sign that was located on Central Avenue. North Branch Arts is a 501(c)3 non-profit organization.